We left late, part of the M4 was shut and the airport bus from parking took ages so we made it to check in with only 3 minutes to spare. Horrible. 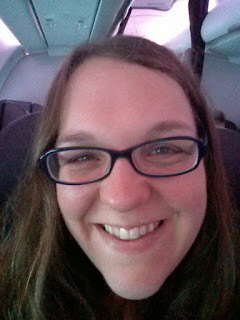 Luckily, because we sprang for premium economy tickets, we got to jump some queues and now we are settled into our big seats with extra legroom being offered juice and bubbly. Totally worth the extra money already. Here I am enjoying premium economy. Have definitely worked hard enough for this this year! I'm slightly ashamed to say this was cast on at the start of June. It is only a vest top knitted in DK but I have not yet got to joining in the round - though that's going to happen on the next row; I juist ran out of time. The main reason for this is, of course, the exam work; but also I cast it on thinking it would be an easy thing to pick up and put down, but I forgot that I was complicating things by adjusting the pattern. It's a Rowan pattern - Fossil - and written for Damask, which is the yarn I am using. It is pieced, so I would already have adjusted it to knit it in the round. However, I also had a slight problem because the pattern wanted 8 balls of Damask for my chosen size and I only have 6 in this colourway. Experience tells me that I will only need 6; maybe into a 7th. Rowan aren't quite as bad as Debbie Bliss for overestimating the amount of yarn needed but they aren't perfect. I have some more of this yarn ("some" lol) in a darker blue colourway which I used to make a vest top in 2009, and consequently did not have enough of to make the Fossil as well. 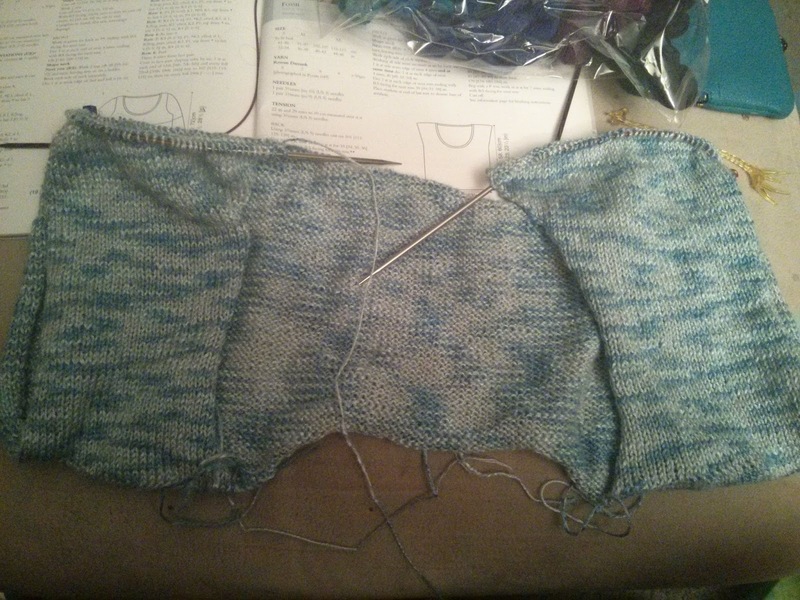 So, I decided I would convert the pattern to a top down: a darker blue stripe would look planned around the bottom of the garment; not so much at the top. So, the bottom-up pieced pattern is now a top-down all-in-one and that meant some concentrating had to be done, and some counting. This meant that, as I curled into my chair for my daily hour off to watch an episode of Game of Thrones, it was easier just to leave the knitting where it was than devote a little brain power to figuring out my next step. Hence, slow. As you can see here, I am almost to the point of joining in the round. I picked up and knit down for the front pieces once I had finished the back. It is going well so far. I am surprised by how much I love how this colour is knitting up: I thought it was a bit insipid in the ball but it is really pretty in the fabric. It reminds me of a mottled, hazy sky. I'm ever so slightly concerned that it looks huge but the gauge was right so I am just going to go with it. At worst I will have to do some serious waist decreases and add a sizable neck edging. This is the one where I casually identify myself as one of this pinko commie enemies of promise. Occasionally, with a bright class, I attempt the political compass test when I am trying to explain to them the difference between left wing and right wing. I find that it's easier for them to understand if they know what side of the line they sit. The questions are complicated so normally what we do is go through them on the board; I explain what they mean; the students write down their responses and then go home and tap them into a computer; they bring back their number and we plot the graph. Going through the questions and trying to explain what they mean in a non-leftie biased way is very hard, and always takes the best part of a lesson. I find it an interesting meditation on my own politics. I also love the way I clarify what something means and several students shout out both yes and no at the same time, very firmly. Then they start to justify their answers....you see why it takes time. Anyway, I attempted this with a top set Y8 class recently. When we plotted results, everyone in the classroom except one boy, O, came out moderately left-wing. O was just over the line on the right. Not too surprising if you believe that theory that everyone is leftie when they're young. At the end of the lesson, Y's planner went missing. We searched and hunted to no avail. I started asking students to look in their bags to see if they'd packed it up by accident. Minutes passed and the bell was long gone. "O," I called, "you were sitting over there, look in your bag please." O unzipped his backpack and then sheepishly pulled out the missing planner. Three (I'm not even kidding) students turned to me from different parts of the classroom and called, almost in unison, "It's because he's right-wing, Miss." I am actually that one Gove was concerned about. It's a while since I made these - way back in May, in fact, for the GCSE revision Sunday afternoon. They were slightly overbaked but still tasted chewy, caramelly and delicious. I can highly recommend Asda's Extra Special salted caramel sauce in a jar - like velvet on a spoon. I adapted the recipe from here. Preheat oven to 160 degrees. Baseline a brownie pan. Whisk together the melted butter and sugars together until combined. Add the egg, egg yolk, and vanilla extract and mix until smooth. Combine the flour, bicarb and salt in the dish of your scale. Slowly add the dry ingredients and mix on low, just until combined. It will be direr than you think it should be (probably). Stir in the butterscotch chips. Press half of the dough evenly into the prepared pan, smoothing the top with the spatula. Drizzle salted caramel sauce over the dough. Top with remaining dough and smoosh out using a spatula. It's ok if some of the caramel sauce is exposed: it will become good and chewy in the oven. Bake for 30-35 minutes or until the top of the bars are light golden brown and the edges start to pull away from the pan. Turn out when cooled and cut into squares. Some of us went to Tutt's on July 4th this year for a loosely-American-themed evening and to celebrate Corners's birthday, so I baked a cake. I picked Mississippi Mud Pie. I'm not going to call it Independence Day; I have recently been doing some reading to prepare for the new A-level I'm teaching next term and I note, with interest, that we refer to it as the American Revolution while the Americans all refer to it as the War of Independence. I'll stick with my people. I combined a couple of recipes and ended up with a tooth-achingly, stomach-clutchingly rich pie. It was probably the first time I baked something meant to serve 12 and actually agreed that it should serve 12. No pictures, naturally. Whizz the biscuits in a food processor until they're broken up. Marvel at how one digestive manages to remain almost whole, spinning around in the processor like someone in a whirlpool. Keeping the processor going, pour in the melted butter. Press into a loose-bottomed tin; I think mine is 10 inches. Chill it until firm, then bake at 160 degrees for 10 minutes. For the cake, melt the chocolate with the butter, rum and espresso powder over a low heat until smooth. Stir in the sugar. Beat the eggs together with the vanilla and the syrup; pour the slightly cooled chocolate mixture over the eggs, beating all the time. Stir in the flour. Pour the mixture over the biscuit crust and bake at 180 degrees for 30-35 minutes, until a cocktail stick comes out clean. For the fudge topping, the final nail in your arteries, heat all the fudge ingredients in a saucepan over a medium heat until smooth and glossy - about 5 minutes. Pour over the cooled cake and stick it in the fridge to set. This may happen. (Sorry it's not in English but the words are less important than what she does with the cake). The end of term is finally here, and was (of course) celebrate with hard liquor, frivolity and loud train journeys. Last summer I made hurricane jelly shots in orange peel, but then had to drive in last minute and forgot about them in the boot of my car. They melted and so when I got home, I fished out the peel, put the tub in the fridge and then ate the reset jelly with a spoon. Marvellous. 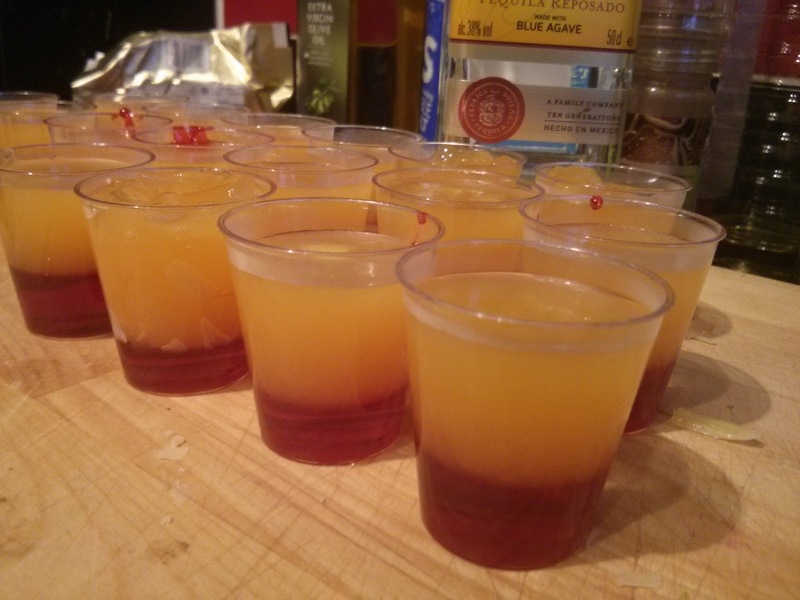 This summer I thought I would tackle a tequila sunrise jelly. When I was a kid, Father Hand used to hang out in the local Mexican restaurant which was run by a Californian and his British wife. These jelly shots were their speciality...naturally I never partook at that young age, except for the kind they made sans tequila. But, tequila and I are having a bit of a relationship renaissance recently and I had some leftover from my attempts at frozen strawberry margaritas a few weeks ago, so I thought I would give it a go. For the grenadine layer, pour the grenadine and water into a small saucepan, sprinkle the gelatine onto it and whisk until dissolved. Stir over a low heat for a few minutes until smooth. Pour into the short glass - these are little plastic ones I got from Asda. For the orange tequila layer, pour the orange juice into a small saucepan, sprinkle the gelatine onto it and whisk until dissolved. Stir over a low heat for a few minutes until smooth.Remove from the heat and stir in the tequila. Carefully ladle over the set grenadine layer and refrigerate until fully set. Firstly, I used vegegel because it was the only granulated gelatine I could get in my online shop. It was odd. It started setting almost before I got it off the heat. You can see the second one from the left looks a bit dodgy - this one was pretty much set on the sides of the beaker from which I was pouring it, so it's not properly moulded to the sides of the shot glass. The two layers were completely detached from one another even though I allowed not setting time between the two - just the time it took me to make up the orange layer. It was OK, but, meh. I wanted something where the orange and grenadine layers would merge a little. Put all the liquids except the rum in a saucepan and sprinkle over the gelatine. Heat gently until dissolved. Stir in the rum. Pour into shot glasses to set. These weren't as nice as last year, when I did it properly, but they still went down well. I had people complaining on Facebook that their hangovers were all my fault, which I take as a compliment to be honest. Not really from the classroom, but a story related to me by the lovely school receptionist. We staged a WW1 experience day last week, with the help of the town council and the local museum; somebody brought in a de-weaponised WW1 gun that made loud bangs when you pulled the trigger with the aid of some kind of gas reaction. It involved propane. I don't know. Neighbour: I want to complain about all this noise. Lovely Receptionist: Oh right. Go on. N: It's very loud. What exactly is going on? LR: It's a WW1 experience day. X, Y and Z are happening. They are looking at some weapons and have a chance to fire a de-weaponised machine gun. LR: Er...didn't they have guns in WW1? N: Well, yes. But anyway. It's very loud, and I don't agree with it. People just love to complain, don't they?